After the successful YIMBY fundraising campaign, the Club will publish a series of progress reports. Alternatively, excerpts from the full reports above are also published below. Program to raise awareness of HIV and how it can be prevented amongst their peers. We are extremely grateful to all those donors to Just Giving who are helping young Rwandans live full and healthy lives. We have developed the My Talent My Health program to change the sexual behavior of young people. The program will train 30 young people as educators of their peers by using dance competitions, talent shows, debates and meetings to facilitate opportunities for the dancers to deliver positive health messages to their peers. We will commence the training program for the young dancers in October 2014 Once it is complete we will organize public events to attract young people from the community with whom our peer educators can interact. As a precursor to holding these events where dancers can be key educators, the Club has been taking dancers to areas where they can perform so attracting large crowds. This enables the Club’s professional health educators to deliver information on HIV prevention and family planning after the performances. These events, funded by the Indigo Foundation have been collaborations with other community organizations such as Anti-AIDS and Drugs Clubs, local police And Local authorities (Villages, Cell, Sector, and District levels). At two recent events, young people were invited to be tested for HIV. Of the 292 people tested 10 were positive. These young people will now be cared for within the national HIV treatment programs. Mandy and D avid Wheen visited Club Rafiki during October / November 2014. During the visit, they spent time with us discussing our plans to implement the My Talent My Health program. They told us they were very pleased with how we plan to spend the money which was generously given to us through the Just Giving appeal. The first element of our program is the training of the young dancers as educators of their peers. The commencement of the long school holidays in November has enabled us to run a five day training program for 35 young people aged 14-19 years. The training was led by the health professionals from the Club Rafiki Youth Friendly Centre / Health program. The training focused on Prevention sexually infections including HIV/AIDS and STIs (Sexually Transmitted Infections) awareness and prevention, reproductive health, peer education, interpersonal communication, and life skills. As the young people move into their advocacy role they will be constantly supported by Club Rafiki Youth Friendly Centre in its activities of VCT services, HIV and Sexual and Reproductive Health Promotion. Peer Educators are trained also to understand and technics to talk with their peers about sexual and reproductive health issues including STIs and HIV prevention, pregnancy prevention, and healthy relationship. It is important to know that these trainees were trained as Urban Dance School participants who will be able to organize more sessions with other young people to capture their views and advisors around them and sensitize others health promotion. The outreach activities will commence on 01 December and run until 30 October 2015. Mandy and David Wheen visited Club Rafiki during October / November 2014. During the visit, they spent time with us discussing our plans to implement the My Talent My Health program. peer education, interpersonal communication, and life skills. World AIDS Day is held on 1 December each year and is an opportunity for people worldwide to unite in the fight against HIV, World AIDS Day was the first ever global health day and the first one was held in 1988. in Rwanda, the issue of HIV/AIDS was around from 1981. Monday, December 1st, 2014 with the support of our program of My Talent My Health, from Just Giving/YIMBY Campaign. We celebrate the world AIDS day together with local authorizes and youth organization like Voice of Youth anti-AIDS and Drugs club, and other clubs from different corners of Kigali City. Celebrations held at Kanyinya sector, Nyarugenge District in Kigali City. We did expand work; mobilization and sensitization. The objective of the day was to reawaken and reinform on reproductive health, HIV prevention, and Test HIV in our generation. Throughout shows (sessions and quiz on Reproductive health), leisure (traditional and modern dancing, poem etc.) and different competitions (Football and dancing competitions). Young people got an occasion of voluntary testing of HIV/AIDS with IEC session (Information Education and Communication) done and they were informed on reproductive health and Drug prevention. By the work done, we really thank Kanyinya sector and health center of Kanyinya for their support. 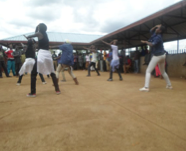 We hosted a dance event here at Club Rafiki on 20 March 2015, it was all about gathering as many people as we can to get to share knowledge with them and give them an overview on what really happens here at Club Rafiki. The event consisted of a dance competition and debates; We had 10 dance crews over, and most of those crew are from around Crew answering questions Nyamirambo area, in those 10 crews 2 were from the Urban dance school. The competition wasn’t only focused on dancing skills but mostly on the knowledge these young people must have on sexual and reproductive health; Reason why for a crew to pass they were to pick a small piece of paper in a basket, on this paper was written a question that they were to answer just to test their knowledge on the topic, the public were there to listen and change behavior. The aim of this event was to show people who came that we do not only teach dancing for our students to be thugs as the majority of people out here think about dancers but we want to form a generation of young people talented and well educated, for them to be models to other young people who can’t have the same opportunity as they have. The best part about all this was that it wasn’t only limited to the dancing crews, we had interactions with the public too, like one of our new peer educators (kids that were formed in my talent my health program) would ask some of the same questions to the public and see what they really know on the topics, it was marvelous to see young kids really focused when it came to debates. Please download the full reports for more information. The July 2014 Just Giving Appeal raised £5,100 to enable the Club Rafiki to further its fight against the scourge of HIV. We team up with dancers in our Urban Dance School Program to raise awareness of HIV and how it can be prevented amongst their peers. We are extremely grateful to all those donors to Just Giving YIMBY fundraising campaign, who are helping young Rwandans live full and healthy lives. We have developed the My Talent My Health (MTMH) program to change the sexual behaviors of young people. The MTMH program trained 30 young people as educators of their peers by using dance competitions, talent shows, debates and meetings to facilitate opportunities for the dancers to deliver positive health messages to their peers.